Home » Food and Nutrition » Is Organic Food Really Better for You? 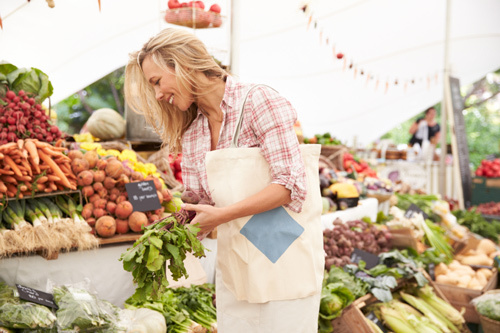 Is organic food better for you? It is important to understand the difference between organic processed food, and organic produce like fruit and vegetables. For instance, you may find the word “organic” on packaged food and refined carbohydrates like bread, cereal, or cookies. In this case, organic is used for marketing purposes as a buzzword to help sell a product. That is because refined carbohydrates still lack micronutrients and contribute to problems like hypoglycemia and weight issues. The key is to select nutrient-dense organic produce, which is high in micronutrients. Getting organic produce is a good thing due to fewer pesticides and other chemicals, and higher nutrient content. That being said, the benefit of eating organic food over conventional produce is widely debated. Some have argued that organic produce doesn’t contain more nutrients. In a study from 2012, Stanford University researchers hadn’t found any nutritional difference between organic and conventional produce. Fortunately there is a greater amount of scientific evidence that suggests that organic produce is more nutritious. In a new study published in the British Journal of Nutrition, researchers found that organic meat and milk contain more than 50% more omega-3 fatty acids than the conventional products. The research team had reviewed 67 studies on meat and 196 studies on milk, which found clear differences in fatty acid composition, antioxidants, and certain minerals. In a study published again in the British Journal of Nutrition in 2014, the Newcastle University researchers found that organic produce would contain between 19% and 69% more antioxidants than conventional produce. The researchers examined 343 peer-reviewed studies comparing organic vs. conventional produce. They also found fewer herbicides, pesticides, and heavy metals like cadmium in the organic produce. Health food store: The health food store is the most common place to buy organic, especially in the winter. It can be pricey for some produce, but try to plan ahead. Make a list before you go shopping, and stick to the list. Farmers market: Farmers markets are great to locally grown organic produce. Not only do you support your community, but you also build relationships with the people that grow you food. That way after farmers’ market season you can stay in touch, visit the farm, and get cold storage produce as well as organic meat and eggs. You may also find that they give you deals once you build a rapport. CSA or organic delivery service: Community supported agriculture (CSA) programs or local food co-ops also allow you to receive or pickup organic produce from your farmer. Some programs are setup where you pay every week or for the entire season. There are also organic delivery services that aren’t necessarily affiliated with a particular farm. Grow your food: From spring through fall, growing your food in a garden is the most cost effective way to get organic produce. Tower gardens and container gardens are also methods used to grow organic food at home. What if you can only afford some organic food? In that case, follow the “Dirty Dozen” and “Clean 15” lists compiled from the Environmental Working Group (EWG). “Dirty Dozen” contains higher amounts of pesticides than the “Clean 15,” and consumers can use the list to decide which produce to purchase conventionally when they can’t afford everything organic. The EWG will also update the lists on a regular basis. Srednicka-Tober, D., et al., “Higher PUFA and n-3 PUFA, conjugated linoleic acid, alpha-tocopherol and iron but lower iodine and selenium concentrations in organic milk: a systematic literature review and meta-and redundancy analyses,” British Journal of Nutrition, 2016; 115(6): 1043-1060, doi: 10.1017/S0007114516000349, Epub, February 16, 2016. “New study finds clear difference between organic and non-organic milk and meat,” Newcastle University web site, February 12, 2016; http://www.alphagalileo.org/ViewItem.aspx?ItemId=161015&CultureCode=en. Aubrey, A., “Is Organic More Nutritious? New Study Adds To The Evidence,” NPR web site; http://www.npr.org/sections/thesalt/2016/02/18/467136329/is-organic-more-nutritious-new-study-adds-to-the-evidence, last updated February 19, 2016. Baranski, M., et al., “Higher antioxidant and lower cadmium concentrations and lower incidence of pesticide residues in organically grown crops: a systematic literature review and meta-analyses,” British Journal of Nutrition, September 2014; 794-811; doi: 20.1017/S0007114514001366.